A variety of nut native to the Middle East and Mediterranean. 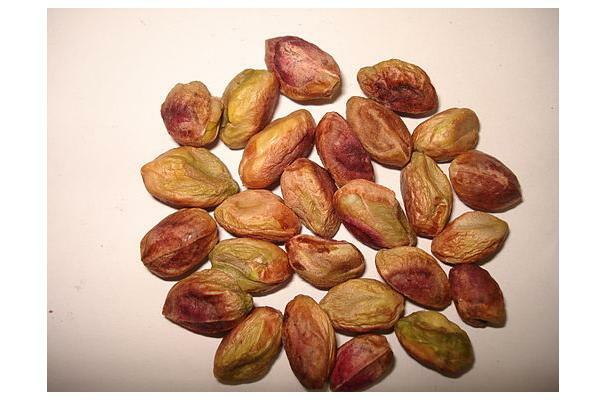 While pistachios are naturally beige in color, they are often commercially dyed green or red. Pistachio nuts are roundish and slightly oblong. When they are roasted in the shell, the shell usually spilts somewhat making it easier to crack the nut and remove it. Pistachios used to be dyed either red or green, but are often found without dye. The nut itself is a beige color with a light green hue. Choosing: Pistachios are available roasted and salted in their shells, which are often dyed red to accentuate their naturally pinkish hue. Shelled pistachios are available in vacuum-packed jars or cans. Buying: Roasted pistachios can be found in most grocers and convenience stores. Procuring: The trees are planted in orchards, and take approximately seven to ten years to reach significant production. Production is alternate bearing or biennial bearing, meaning the harvest is heavier in alternate years. Peak production is reached at approximately 20 years. Trees are usually pruned to size to make the harvest easier. One male tree produces enough pollen for eight to twelve nut-bearing females. Harvesting in the United States is often accomplished by using shaking equipment to shake the nuts off the tree. Cleaning: Pistachios only require removing the shells to eat. If stored pistachio nuts have lost their crispiness, place them in a single layer on a baking sheet and toast them for about 10 to 15 minutes at 200 degrees. Allow the pistachios to cool before you eat them. When you thaw frozen pistachio nuts, place them in a plastic bag to prevent the formation of condensation. Pistachios shells are naturally a light tan or off-white color, and the ripe nuts are green. Bright pink and red pistachios have been artificially colored. History: The modern pistachio nut P. vera was first cultivated in Western Asia, where it has long been an important crop in cooler parts of Iran. It appears in Dioscurides as pistakia πιστάκια, recognizable as P. vera by its comparison to pine nuts. Its cultivation spread into the Mediterranean world by way of Syria: Pliny in his Natural History asserts that pistacia, "well known among us", was one of the trees unique to Syria, and in another place, that the nut was introduced into Italy by the Roman consul in Syria, Lucius Vitellius the Elder (consul in Syria in 35CE) and into Hispania at the same time by Flaccus Pompeius. The early 6th-century manuscript De observatione ciborum (On the observance of foods) by Anthimus implies that pistacia remained well known in Europe in Late Antiquity. More recently, pistachio has been cultivated commercially in the English speaking world, in Australia, New Mexico, and in California where it was introduced in 1854 as a garden tree. David Fairchild of the United States Department of Agriculture introduced hardier cultivars collected in China to California in 1904 and 1905, but it was not promoted as a commercial crop until 1929. Walter T. Swingle's pistachios from Syria had already fruited well at Niles by 1917.